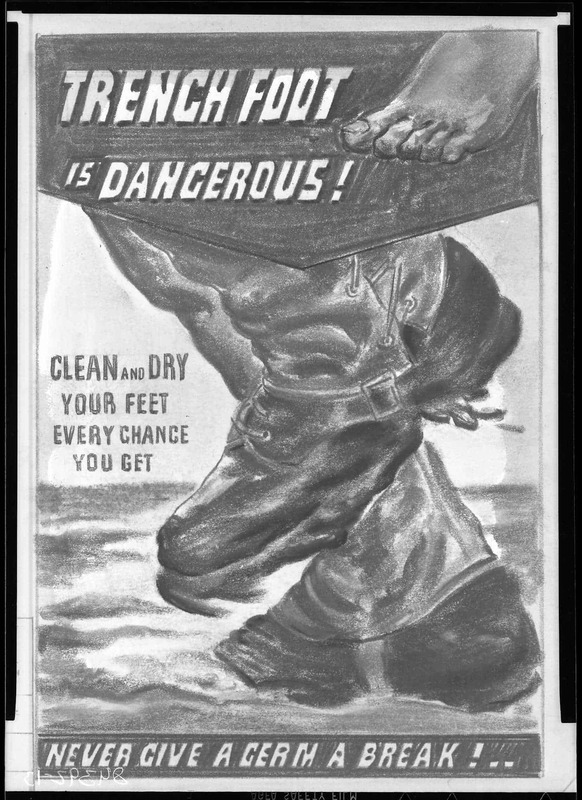 Trench foot is not a war injury. Rather, it is an injury that developed due to the precarious living conditions soldier were forced to endure throughout the First World War. How did soldiers get Trench foot? By staying in cold water or areas with much moist. During the cold 1914-1915 winter, trench foot was reported under several names, i.e. ‘frostbite, chilled feet, effects of exposure, N.Y.D. feet, or feet cases’ (The Medical Front no date). The main difference between the Austrian and German trenches as compared to the French, Americans, and British trenches consisted in the latter being on lower elevations. Such characteristic of the land would mean two things: firstly, water would be accumulated quickly when it rained; and secondly, one did not have to escalate extensively before naturally reaching water. It was easier to be affected by Trench foot especially on lands that were close to the sea level. In fact, it was enough to dig half a metre before the trenches would be filled up with water. Water in trenches was a problem that the allies’ troops (i.e. Serbia, Russia, France, United Kingdom, Italy, Belgium, USA) had to face. Being drenched in water for long hours caused soldiers to develop a fungus which was named ‘trench foot’ and would destroy soldiers’ feet. 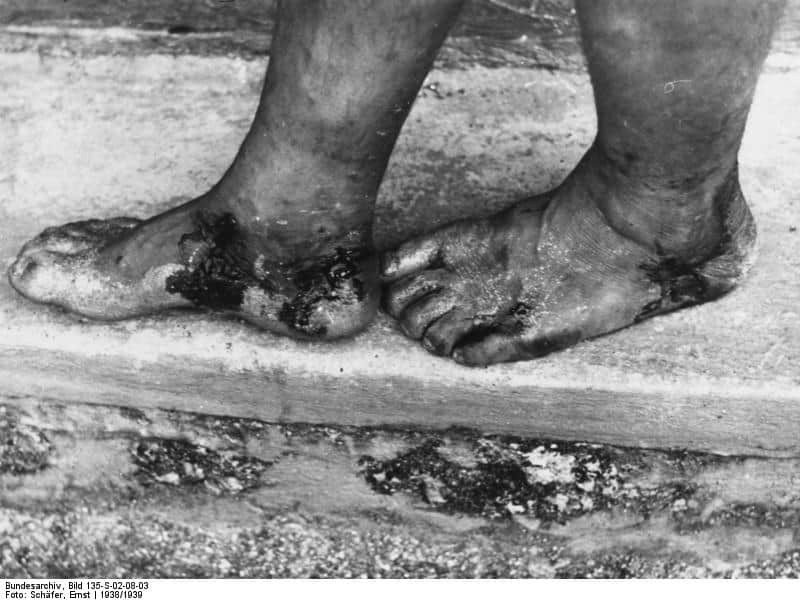 Trench foot often resulted in the amputation of toes and/or feet in order to avoid the infection spreading to the rest of the body and getting into the bloodstream. Far from being the exciting war that Europe had envisaged during the years preceding the combat, throughout the First World War, over twenty million people died, whereas twenty-one million people were injured (Biomedical Scientist 2018). Although many of them died during combat, other died due to the harsh, abominable, unsanitary conditions they were obliged to live in. 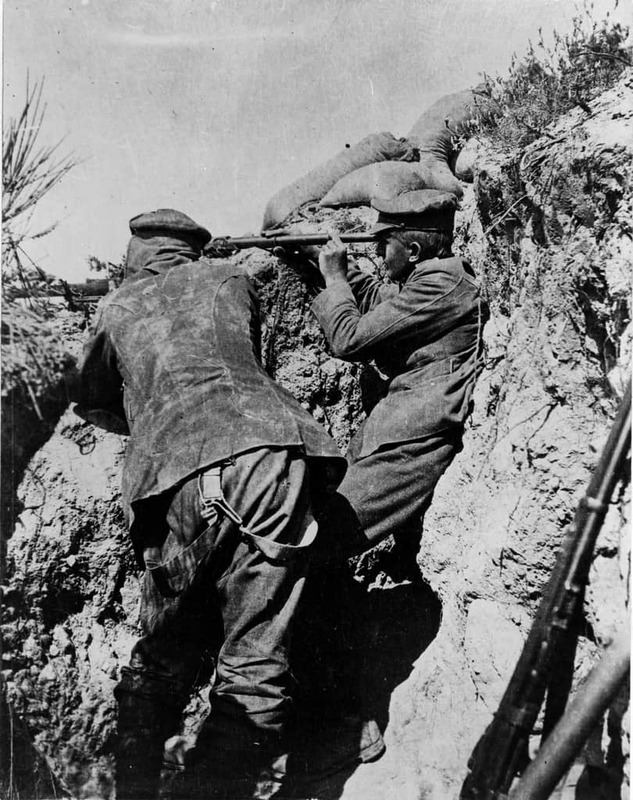 Moreover the lack of food, and the spreading of diseases such as ‘fevers, parasites, and infections’ made life in the trenches a living nightmare (Biomedical Scientist 2018). Soldiers had to endure various types of conditions, including ‘influenza, typhoid, trench foot, and trench fever’ (Biomedical Scientist 2018). Their sanitary conditions brought them to death just as much as weapons did. In fact, it was easy to get infected, as the Curator of the Army Medical Services Museum (Aldershot, Hampshire) states, ‘a simple cut to a finger from cleaning your gun or digging a trench could quite quickly become infected and develop pneumonia’ (Biomedical Scientist 2018’ citing Gage). The scene soldiers lived in is similar to a horror movie: Gage continues… ‘the men were knee-deep in mud nine out of twelve months of the year, surrounded by bacteria from the bodies of men and animals in no man’s land’ (Biomedical Scientist 2018; citing Gage). In fact, as Walters claims, in trenches one could find not only the corpses of fellow soldiers but also ‘dead horses and human excrements’ (1916). Furthermore, illnesses could attack them since their immune systems were debilitated due to ‘lack of sleep, wet and dirty clothes and a restricted diet in which a piece of fruit or vegetable was a treat’ (Biomedical Scientist 2018’ citing Gage). In essence, it can be stated that the fighter’s immune system was not strong both for the physical and psychological conditions that induced stress. Sources claim that officers did not have to deal as much with Trench Feet, since it was the infantry – the most exposed part of the army – that suffered the most from this disease (The Medical Front no date). Although this article discussed the general degrading conditions endured by soldiers, our main discussion will focus on Trench foot, i.e. a disease that – according to the 51st Field Ambulance – manifested itself in over 6.8% of WWI’s soldiers (Biomedical Scientist 2018). Trench Foot was a ‘grave problem’ that Allies had to endure especially during the winter months (Microbiology Society 2014). In fact, soldiers had to march for miles on muddy, wet paths, and the weather was not the most favourable since it was very often below zero (Microbiology Society 2014). Such disease was common for the courageous men battling in the trenches. In fact, between 1914-15, over 20,000 Allies suffered this condition, and by 1918, over 74,000 people had been affected (Biomedical Scientist 2018). Having dug the trenches, water would immediately fill the space up, and soldiers were obliged to remain there ‘in soaking wet socks and boots’ for hours (if not days) (Biomedical Scientist 2018). Therefore, such a condition would cause the soldier’s feet to ‘swell and go numb, and then the skin would start to turn red or blue’ (Biomedical Scientist 2018). As a consequence of constantly having damp feet, soldiers that were not able to appropriately cure their condition were faced with gangrene which ‘could lead to nerve damage, tissue loss and ultimately the need for amputation’ (Biomedical Scientist 2018). According to the Microbiology Society, in grave cases, the blisters that developed on the foot contained ‘clear “gangrene smelling” fluid’ (2014). In other cases, the disease would become manifest only after several weeks: in fact, in those instances, the foot would not have an ‘abnormal appearance’, yet, would present ‘severe pain and acute cutaneous hyperaesthesia’ until it would become ‘very red and hot’ (The Medical Front no date). What was a way to prevent trench foot? The Medical Front (no date) provides its readers with detailed instructions on how to prevent the disease. It claims that the person affected by it should ‘lie down’ in order to ‘keep the feet elevated’..also, the feet should be ‘washed with soap and water, followed by an antiseptic lotion, an injection of anti-tetanus serum must always be given..[subsequently] the feet should be painted with a 1% solution of picric acid in spirit…when the feet remain cold and numb they should be frequently rubbed, and in the interval wrapped in cotton wool…[however], if they are red and hot they are often best left exposed, for wrapping in wool only aggravates’ (The Medical Front no date). However, such advice seems fairly impractical for soldier fighting to protect their lives in abhorrent conditions in WWI’s trenches. Therefore, one of the suggestions given to the men in the trenches was that of changing socks as frequently as possible, and John Logie Baird made a business out of such a problem by making socks with sodium borate which would ‘help alleviate wet feet’ (Biomedical Scientist 2018). However, the resulting loss of soldiers able to fight against their opponents, introduced the need of another solution which consisted in paving the trenches with a wooden floor and the inclusion of drainage systems (Walters 2016). If the measures stated above were not observed, the army’s officials were considered ‘responsible for the development of Trench Foot’ (Walters 2016). Although some were able to fight Trench Foot and recover, they nonetheless remained ‘more susceptible to a second attack’ (The Medical Front no date). Although it was more diffused during the First World War, the Trench foot disease was also reported during the Napoleonic wars, and throughout the cold Russian marches, Trench foot was already ‘a familiar condition’ (The Medical Front no date). Such condition was also reported in the Crimean War (1854-1856): during this time, one could get Trench foot not only because of the same environmental reason stated in the previous paragraphs, but also because of ‘the lack of opportunities for changing the clothes, tight boots, fatigue, and defective nutrition’ (The Medical Front no date).